I really like hot dogs. I know I shouldn’t, they’re probably full of scrotums and eyelids, but they’re one of my go-to comfort foods. Top marks then, from theatre promoter Carole Wears, who offers up a wiener-themed production at Gosforth Civic Theatre on Wednesday 24th and Thursday 25th October, complete with sausagey samples. 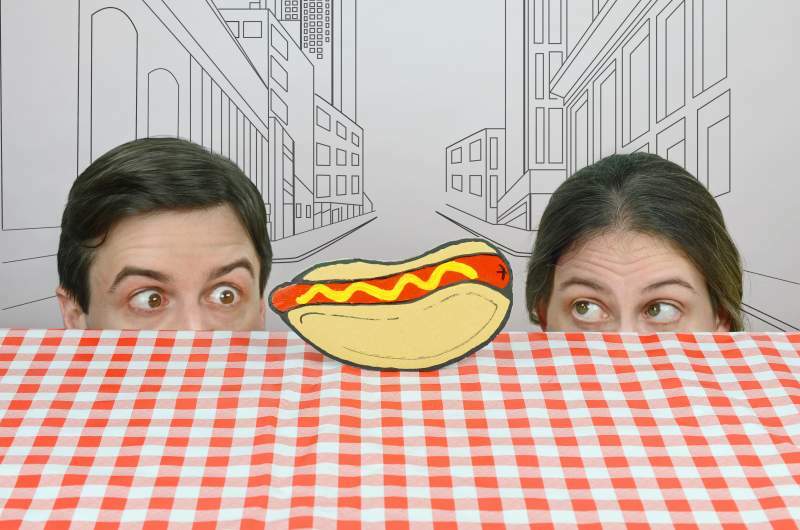 Nathan And Ida’s Hot Dog Stand is a heart-warming and hilarious two-hander created by comedy collaborators Ida Berg Berglöw Kenneway and Nathan Peter Grassi. Inspired by the true story of the founders of Nathan’s Famous hot dog restaurants, it’s a tale of the American dream come good, told with panache, warmth, humour and a puppet or two. Audiences can try out Nathan and Ida’s secret hot dog sauces for themselves as the theatre will serve up dogs and buns before the show. The question I want answered is: grilled or boiled? !